Green Beans with Garlic Chips, Thyme for Cooking gourmet side dish. I used the flat, Italian beans for this but any tender green bean will work. Garlic chips are not as strong as you might think, and they get lovely golden and crisp. You can just used the garlic-infused oil if you think the chips might be too strong.... but, taste one.... Sage is good with beans, a change from the more traditional savory. Put an inch of water in the bottom of your steamer and bring to a boil, covered. Cut the stem end off of the beans, leave whole, with tail on. Add beans to steamer, cover and steam for 10 minutes. Remove beans and place on serving dish. While beans steam, peel and slice the garlic cloves as thinly as you can. Heat oil in small skillet over medium heat. Add garlic and fry until golden, turning once, about 5 minutes total. Add ham, sage leaves and sauté until starting to crisp, another 3 - 5 minutes. 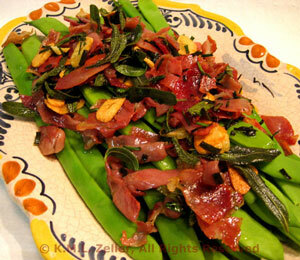 To finish: Spoon ham, sage and garlic chips on the beans, then drizzle the oil over all and serve. Note: If making in advance, when beans are done plunge into cold water to preserve color. Remove and drain. When ready to finish put beans on a baking sheet and into a warm oven, 220F (100C) to warm for 5 - 10 minutes.